My take on this timeless classic should convert even those who are most reluctant to eat liver. What’s more, because the liver is served slightly pink, it all comes together quite quickly. Heat a medium pan over a medium-low heat and add a small trickle of oil, followed by the bacon. Sauté until the pieces start to render a little fat and take on some colour. Add the onion and fry gently for 5 minutes, stirring as it cooks. Add the garlic and chopped sage and continue to cook for 3–4 minutes. Now add the brandy, if using, and reduce by half. Pour in the stock, add the thyme and some pepper and bring to a simmer. Let simmer for 15–20 minutes, or until the liquid has reduced by two-thirds. Keep warm over a very low heat. Meanwhile, trim any white ventricles from the liver, then carefully cut it into nice even slices, 1cm thick, using a sharp knife. Season the pieces of liver with salt and pepper, then dip them in the flour to coat. Heat a large frying pan until hot, then add a little oil or lard. Now add the sliced liver and cook for 1 minute on each side, no longer. Remove the liver from the pan and add it to the bacon and onion mix. Toss the liver through and bring it all back to a simmer, but for no more than a minute. 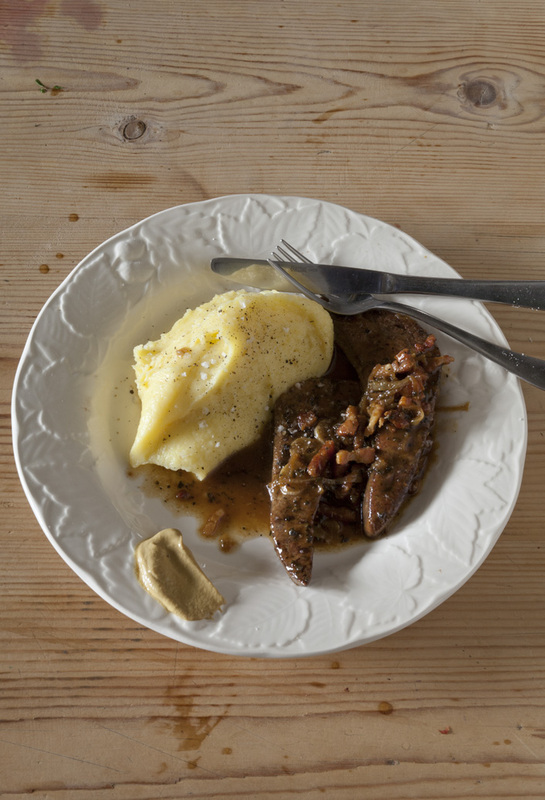 Divide the liver, onion and bacon between warmed plates and serve with mash and mustard, or a summer salad.